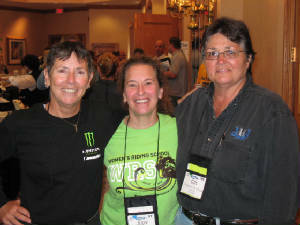 A great website for women motorcyclists. MSF schools around New England that cross link with the WRS. Sarah Lyon's full-color 14 month wall calendar featuring women mechanics and their stories of how they entered into the non-traditional labor field of mechanics. Look closely at Ms December... You may recognize Valerie Figarella, owner of MotorGrrl in Brooklyn, NY - as she's a past graduate of the Women's Riding School! Go Val! Learn to properly lift a downed motorcycle using the "Skert" method. Visit her web site for informational photo's and the video. The ASMI offers great classes on bystander assistance specifically designed for motorcycle accidents. The WRS hopes to sponsor a class in the near future, stay tuned. Ash Brittenham is an artist and writer living with his family in Montpelier, Vermont. He loves superheroes and dogs and these often appear in his books. His book, "Cat & the Scary Dog," won a Vermont Public Television Reading Rainbow Award in 2004 and "The Adventures of Super Max" won the same award in 2005. Living with Duchenne Muscular Dystrophy (DMD), Mr. Ash Brittenham is happy to further the push for a cure for Duchenne's M.D. by having all revenues from the sale of this children's book go directly to Parent Project Muscular Dystrophy (PPMD), as a fundraiser. Ash comes from a family of motorcyclists... many of you know his Mom - Kim Brittenham, creator of CybercycleMagazine.com and later editor of MotorcycleWorld.com We at the WRS, wish Ash and Kim all the best with this fundraiser! 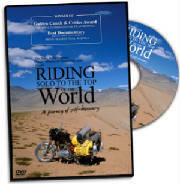 Film Review - "Riding Solo to the Top of The World"
Riding Solo to the Top of the World, a film by Gaurav Jani, takes you to some of the most remote places in India as you see the world from Jani's simply packed 350cc Royal Enfield. Allow Jani to whisk you away to the Changthang Plateau, an area of the Himalayas where you will see him cross the world's highest pass - over 18,500 feet in elevation. Jani's goal is the Chinese border where the Changpa, a small nomadic tribal community of goat herders dwell. This is a magical story of adventure and of finding ones self. What appeared on the outside to be just another motorcycle documentary unfolds quickly into a colorful story of a man, a motorcycle and of a beautiful landscape - filled with all things wonderful. Jani's sense of self makes you comfortable from the start, the pictorial landscapes and ride adventure keeps you captivated and as Jani makes friends in the most unlikely places, you too will find salvation at the Top of The World. 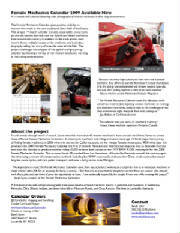 To see a preview of the film and to order your copy - follow the Dirt Track Productions link above or click on the photo. If you thought Riding Solo was good.. hold onto your hat, or should I say, your throttle. Gaurav has an amazing artful eye and captures moments of movement that will overwhelm your senses. I couldn't just watch the video once through.. I had to watch it twice immediately. I must admit, his moments of riding solo are priceless. His story telling ways are unmatched and his choices for road routes would curl anyones hair. There is just something about his quiet strength and persistence that keeps you on the edge of your seat. The One Crazy Ride Team pulls together to give us all the adventure on film we only wish we could experience. I will never tire of watching One Crazy Ride or Riding Solo to the Top of the World. You can't help but become a Gaurav fan and cheer loudly for his success. I am looking forward to his next adventure on film. It can't come soon enough.